Thom will perform two shows as part of ECMA 2017 in Saint John, New Brunswick, including a performance as part of the Folk Music Stage on Saturday and the Songwriters’Circle on Sunday. 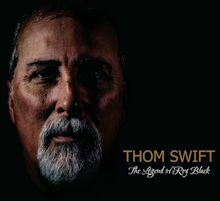 Thom has been nominated for two Music Nova Scotia Awards, including Solo Recording of the Year & Americana Recording of the Year for his fantastic new album, The Legend of Roy Black. Awards will be given out at Nova Scotia Music Week in Truro this November. Catch Thom’s performance there at the Marigold Cultural Centre, Friday, Nov. 4.